How can folding socks and sorting your cupboards give you greater clarity? 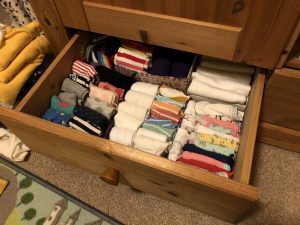 When you take inspiration from the KonMari way, of course! There’s a craze sweeping the nation with the release of the new Netflix series featuring Marie Kondo and six American families in need of a major clear out. Despite being a reluctant tidier, I have been inspired to give this ago in our house. As well as the obvious outcome that things are more organised, I found that it’s having a double-bubble bonus of helping us get clear on what we really want and need in our lives and a lovely feeling of living more authentically. Isn’t this just another fad? I generally try to avoid dogma in life. What I like to do is borrow ideas from a wide variety of sources and blend them into my own approach to life and work. I encourage my coaching clients to do the same by creating their own measures of success in life or business, rather than simply subscribing to an out-of-the-box system as they rarely fit us perfectly. What’s interesting is that when I tried reading the Marie Kondo book a few years ago, I found it too wordy in style and dogmatic in approach. Only two chapters in I felt that I had been ‘told off’ and inadequate for not folding my socks in the right way. I also felt like I had to have completely minimal shelves and give away most of the contents of our house. The easy-breezy reality-show format of the Netflix series has actually helped to cut through the dogma and show real families sorting and sifting – and literally taking the weight off their own shoulders. Most importantly, Marie comes across as far less militant in real life. She shows real compassion for the families and the realities of everyday family life, rather than the minimal ideal her book reflects. I was, however, inspired by the idea of selecting items based on how much joy they spark. This is the main theme of the KonMari way. Personally, I’m not really aiming for pure minimalism. I like to think of this tidying process as a work in progress and an intention to simplify and appreciate what we already own. Ultimately it should also help us reduce how much we are bringing into the house by being more aware of what we have already. OK, so I started with kitchen items a while back when clearing out for our kitchen project. At that point, I was simply checking in with whether I wanted it in the new kitchen or now and how often I used it – rather than whether it sparked joy. Since being inspired by the series, I have tackled the tea towel drawer and can now see what I have and get to each item without loads of tea towels cascading out of the drawer. We then tackled the playroom with our daughter and used the ‘sparking joy’ idea to make quicker decisions about what to keep, give away or sell. We have started on clothes by tackling our over-stuffed underwear drawers first. Interestingly, while watching YouTube videos for tips on folding socks, my 5-year-old daughter got stuck right in and took over the folding and sorting of her underwear drawer (see pic above). I’m so impressed! Rather than only following Marie Kondo’s tutorials, we’ve found lots of YouTubers that we like who have their own take on the KonMari way. 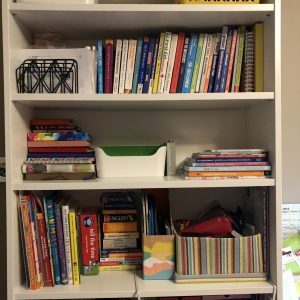 Of course, there are many other schools of thought in the decluttering world – most of them are simply helpful ways to get us off our bums and sorting our stuff out! 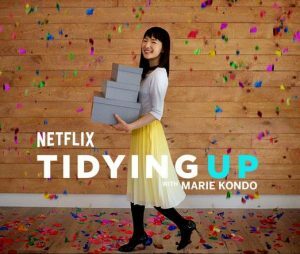 We’ve been discussing the Marie Kondo Netflix series on my wonderful online Mums’ group and a bunch of us are giving the KonMari way a go. So far we’ve tacked airing cupboards, tea towels drawers, wardrobes, kitchens and a bathroom cabinet, and the momentum is growing. Even some of the husbands have got in on the act! We may not be doing it in Marie’s perfect, minimalist way, but many of us have been surprised at how freeing it is to have a simple way to sort and make decisions to let stuff go. And some neat hacks to fold and store things in a way where we can see and enjoy what we own. One friend on the group, Angela said: “I thought I had a fairly organised home. Everything has a place and I use boxes and baskets to sort stuff into type. But I binge watched Marie Kondo on Netflix and thought I would test the ‘sparking joy’ method on the laundry cupboard. “Oh my goodness. What a difference! “The sparking joy thing is a revelation. By touching everything and asking does this really bring me joy, I’ve halved the amount of towels I had stored in there! “I’ve struggled this year with finding time to do nice things for me. I seem to spend all my time doing laundry, washing up, cleaning etc. I’m hoping if I can reduce the things I use every day, the upkeep will go down and the time I spend on it too will. The other half of our playroom is my workspace. It was in desperate need of a full sort-out not only to be actually able to work at my desk, but to clear the clutter of 2018’s paperwork, planning sheets, post-it notes and other piles of papers that were getting on top of me. It was also clouding my thinking and planning for what I want to achieve in 2019 in my business. I can honestly say that I feel much clearer on what I need to do business wise and more able to sit and plan the next steps. I’ve really enjoyed sitting at my desk the last few days. I’m not the only one with the bug. 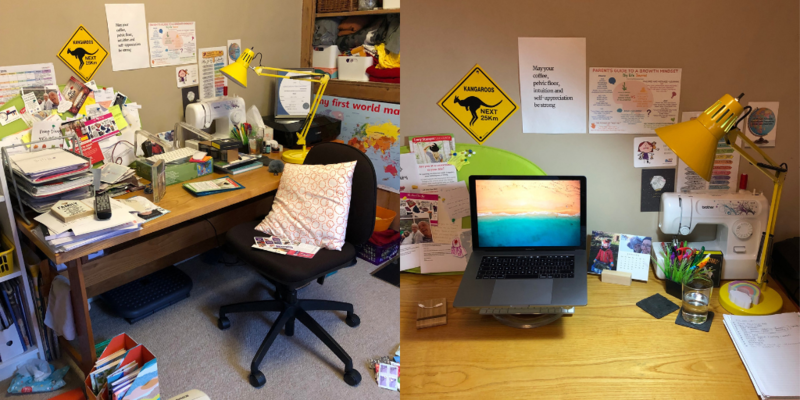 “Sorting and tidying my home office has been on my to do list for quite a while. I finally managed to do it and once I started, I kept going, filing, sorting and creating areas on my walls for testimonials, my design work, quotes and buying a couple of plants. Get in touch to book your free discovery session to find out how coaching can help you get clarity, confidence and improve your work-life-family balance. There’s no obligation and no charge for this 45-minute discovery call. If you like my approach, then we can book your first session and start your journey to make changes with confidence.